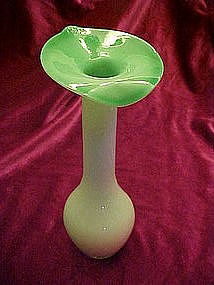 Pretty Jack in the Pulpit art glass vase measures 8 1/4" tall. The base is white cased in clear glass, and the entire inside and exposed lip is a pretty green. Pristine condition. I am clueless to the maker or the date of this vase, but it sure is pretty!